I have some posts to write about Cantor but first I would like to request a help to KDE packagers of several Linux distros around the world. I received some mails from users asking “how can I use python in Cantor?” or “where is python support in Cantor?”. 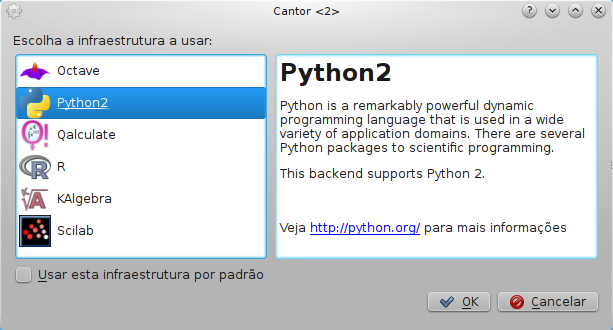 Well, python2-backend is available in Cantor since KDE 4.12 release. If you is using KDE >= 4.12 but you can not to use python in Cantor, maybe the package was not build correctly. python 2 development library (commonly packed as python-devel in some Linux distros) is required to build python2-backend. python 2 is required to use Cantor with python 2. Then if you are a Cantor user and can not to use Cantor with python, please write a bug report in the bug management system of your distro. You can to put a link in the bug report to this post too. Anyway, if your distro bring or not bring python2-backend, write a comment below and I will make a table with this information. [UPDATE May 13, 2014] – In FISL I and Paulo Andrade, a Mandriva/Conectiva employer, noticed that Cantor is missing the Python backend in Fedora. Paulo wrote a bug report and the packager fix it. Maybe in one week the Cantor with the fix will be available in Fedora repositories. Thanks Paulo! « See you at FISL 15! Works on Kubuntu 14.04, but you do have to install the cantor-backend-python package. In a related subject, could you confirm the follow bug – https://bugs.kde.org/show_bug.cgi?id=330032? Can you import numpy in Cantor (import numpy)? At least I (the original reporter) can reproduce it on a fresh install of 14.04.